It’s very straightforward so let’s get started. 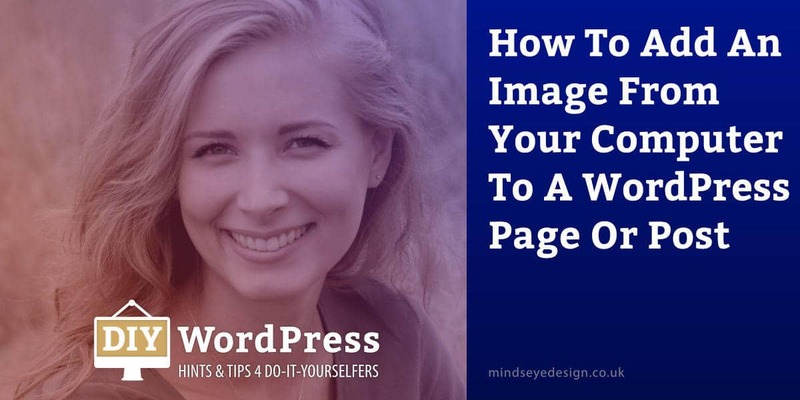 The easiest and quickest way to add an image to your WordPress page or post is to drag & drop it directly into the Visual Editor. Ensure that your WordPress Visual Editor screen is open and displaying the page or post that you want to add the image to. Place your cursor where you want the image to go. Navigate to the folder on your computer that contains the image you want to add to your WordPress page or post. Select the image with your mouse and drag it onto the Visual Editor. Drop it in the position you want the image to appear. The image will automatically upload and a Media Library window will open where you can edit the image’s details. You can also align your image, link it to the Media File and choose the size you want it to appear in the Attachment Display Settings to the right. When you’re happy with your settings, click on the ‘Insert into post’ button at the bottom of the window. You will now be taken back to the Visual Editor, where you will see your image in your page or post. Tip: Make sure you give your media ‘Alt Text’ using the Attachment Details in the box on the right, which gives it search engine visibility. Remember, the image is automatically added to your Media Library and can be used elsewhere on your website in other pages and posts as well. Yes, you can also add images to your page or post by clicking on the ‘Add Media’ button above the formatting Toolbar in Editor, as explained in our post ‘Add Media from Library’. This opens the Media Library and allows you to drag & drop images from your computer directly into your Media Library. From there you can create a Gallery, which will be talked about in our ‘Image Galleries’ post or just add a single image as we did above. When you’ve finished, click on the ‘Preview Changes’ button in the Publisher box to the right, so you can view how your image will appear on your website. Once you’re satisfied with how it appears to the rest of the world, click on the ‘Update’ or ‘Publish’ button to make your changes live.